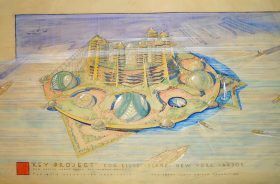 Designed by Philip Johnson for the 1964-65 World’s Fair to embody the architectural essence of Space Age futurism, the New York State Pavilion has been battered by the ensuing decades to the point of becoming valued as an “historic ruin.” As 6sqft previously reported, plans to restore the site have been progressing slowly even with new funding from the city. Now, Curbed reports, the iconic site in Flushing, Queens, will be getting a $16.5 million grant from FEMA for Hurricane Sandy-related repairs. 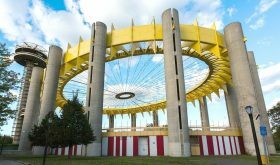 Designed by starchitect Philip Johnson for the 1964-65 World’s Fair to embody the architectural essence of Space Age futurism, the New York State Pavilion, has, in the ensuing decades, become what amNY called a “hulking 54-year-old relic of the World’s Fair,” though it has never lost its modernist cachet and has gained value as an historic ruin of sorts. Recently, talk of restoring the pavilion beyond its current inglorious purgatory slowly appears to be moving toward actual plans with funding attached. City officials and preservationists have secured $14 million for specific repairs and improvements to the pavilion. 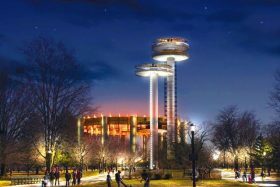 The iconic New York State Pavilion in Flushing Meadows-Corona Park is set to undergo a $14.25 million renovation funded by the city. 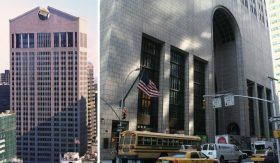 As first reported by the Queens Chronicle, repairs of the monument will begin next spring, which will include some structural conservation work and electrical and architectural improvements. 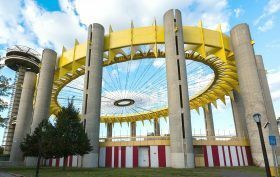 The pavilion, which was originally designed for the 1964 World’s Fair by Philip Johnson and Lev Zetlin, has been ignored for the past few decades, largely in part because of the city’s failure to find the money for repairs. 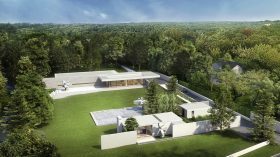 As any modern architecture aficionado knows, the Glass House is Philip Johnson‘s best-known residence. However, it’s not his first. That title goes to the Booth House, built in 1946 (three years prior to the New Canaan beauty) in rural Bedford, New York. 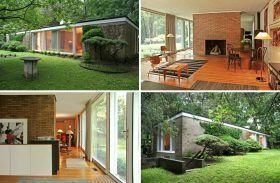 Like the Glass House, it boasts Johnson’s iconic floor-to-ceiling glazing, location atop a grass podium, and internal organization around a central fireplace. 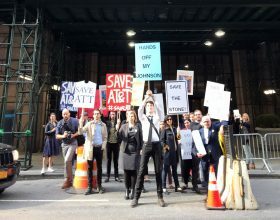 But unlike the Glass House, now a historic house museum, the Booth House is not protected, and moreover, its title is in litigation which means it could very well face the wrecking ball. Therefore, Archpaper tells us that the long-time owners have listed the home for $1 million in hopes that a preservation-minded buyer will step up.